Following a career of public service, former Congressman Wes Watkins and his wife Lou are enjoying their retirement in Stillwater, Okla., the town where they first met more than 50 years ago while attending Oklahoma State University. Planning for the future, the Watkins were looking to downsize their estate and sell land that had significantly increased in value over the years. The couple worked with the Oklahoma City Community Foundation to create a deferred charitable gift annuity (CGA) with the real estate that will benefit several causes important to them while also supplementing their retirement income and creating a tax savings. 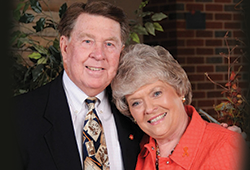 The Watkins' CGA will yield an additional income stream for life, then the remaining assets will support scholarships through both the FFA and OSU foundations, as well as benefit the Lou Watkins Endowed Lectureship at East Central University in Ada, Okla., and the Fairlawn Cemetery in Stillwater. "This was a great way to help several groups that we feel strongly about, while also allowing us to offset potential taxes associated with selling the land," Mr. Watkins says. For your clients of retirement age who are interested in charitable giving while also creating a current income stream, a CGA might be the perfect strategy. We can help your clients establish a CGA through a gift of cash or other assets, guaranteeing a set income for life. At the end of the annuity, the remaining assets will go to the charitable fund of their choice. For more information about thesix CGA options we offer, please contact Joe Carter at 405/606-2914.